This article studies a new criterion for the induced l∞ stability of fixed-point state-space digital filters without overflow oscillations and instability due to finite word length effects. The criterion not only guarantees exponential stability but also reduces the effect of external interference to an induced l∞ norm constraint. We present a numerical example, which demonstrates the effectiveness of the proposed criterion. When designing a linear time-invariant digital filter using a fixed-point arithmetic, one encounters quantization and overflow nonlinearities. The presence of these nonlinearities may result in the instability of designed filters. 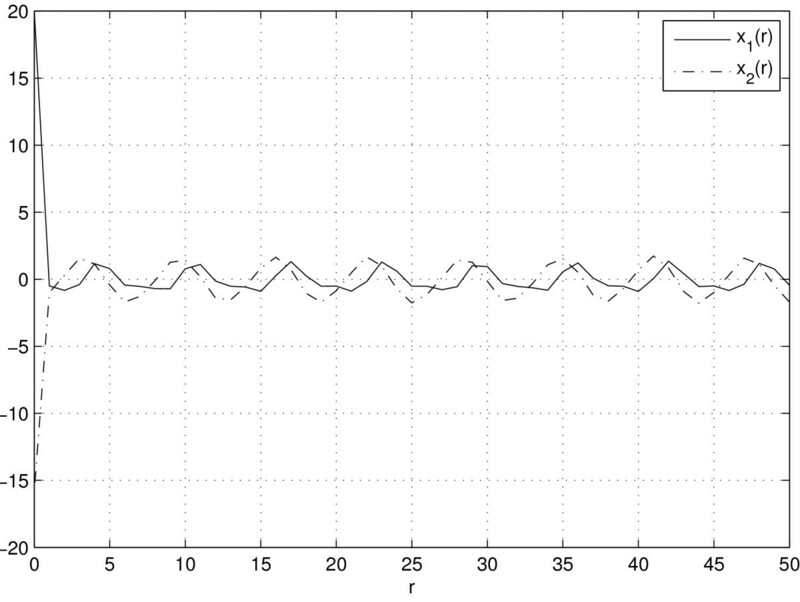 The zero-input limit cycles, which are undesirable, may possibly occur due to these nonlinearities. The quantization and overflow nonlinear-ities may interact with each other. However, if the number of quantization steps is large, quantization effects may be decoupled when investigating the effects of overflow. Several researchers have studies stability criteria for digital filters employing saturation overflow arithmetic [1–8]. In the hardware implementation of high-order digital filters, they are usually split into some biquad filters before hardware implementation. Then, there may exist interferences between these biquad filters. These interferences lead to malfunction as well as destruction in the last [9, 10]. However, most existing stability criteria for digital filters are only available under specific conditions without external interference, while in unfavorable environments with external interference, unfortunately, we cannot use these existing stability criteria any more. Therefore, it is important to study an alternative criterion that can overcome the shortcomings of existing stability criteria for digital filters. There always exist model uncertainties and external disturbances in real physical systems. In recent years, this had led to an interest in the induced l∞ approach [11, 12]. The induced l∞ approach is an effective tool to treat several dynamic systems because we can obtain general stability results using only inputs and outputs measurements. Now, the following question arises: is there an induced l∞ stability condition for digital filters with external interference and saturation arithmetic? However, as far as we are aware, for the induced l∞ stability for digital filters with external interference and saturation arithmetic, there are no results published in the literature so far. This article studies a new stability criterion for fixed-point state-space digital filters with external interference and saturation arithmetic via the induced l∞ stability approach. This criterion is a new contribution in fields of digital filters. Under the proposed criterion, the digital filter is exponentially stable and the induced l∞ norm from the external interference to the state vector is reduced to an interference attenuation level. For a fixed scalar variable, we represent this criterion in terms of linear matrix inequalities (LMIs), which can be solved efficiently via existing numerical algorithms such as interior point algorithms [13, 14]. This article is organized as follows. In Section 2, a new criterion for the induced l∞ stability of fixed-point state-space digital filters is proposed. In Section 3, a numerical example is given, and finally, conclusions are presented in Section 4.
f i ( 0 ) = 0 , 0 ≤ f i ( y i ( r ) ) y i ( r ) ≤ 1 , i = 1 , 2 , . . . , n .
under zero-initial conditions for all nonzero w(r). The parameter γ is called the induced l∞ norm bound or the interference attenuation level. In this case, the digital filter (1)-(3) is said to be exponentially stable with induced l∞ performance γ. In the following theorem, we present a new induced l∞ stability criterion for digital filters. then the digital filter (1)-(3) is exponentially stable with induced l∞performance γ.
Δ V ( x ( r ) ) = V ( x ( r + 1 ) ) - V ( x ( r ) ) = f ( A x ( r ) ) + w ( r ) T P f ( A x ( r ) ) + w ( r ) - x T ( r ) P x ( r ) = f T ( A x ( r ) ) P f ( A x ( r ) ) + f T ( A x ( r ) ) P w ( r ) + w T ( r ) P f ( A x ( r ) ) + w T ( r ) P w ( r ) - x T ( r ) P x ( r ) + 2 f T ( A x ( r ) ) M [ A x ( r ) - f ( A x ( r ) ) ] - 2 f T ( y ( r ) ) M [ y ( r ) - f ( y ( r ) ) ] . f T ( A x ( r ) ) f ( A x ( r ) ) = f ( A x ( r ) ) 2 ≤ A x ( r ) 2 = ( A x ( r ) ) T A x ( r ) . δ [ x T ( r ) A T A x ( r ) - f T ( A x ( r ) ) f ( A x ( r ) ) ] ≥ 0 . Δ V ( x ( r ) ) < - λ x T ( r ) P x ( r ) + μ w T ( r ) w ( r ) = - λ V ( x ( r ) ) + μ w T ( r ) w ( r ) . 1 γ x T ( r ) H T H x ( r ) - γ w T ( r ) w ( r ) = 1 γ x T ( r ) H T H x ( r ) - ( γ - μ ) w T ( r ) w ( r ) - μ w T ( r ) w ( r ) < 1 γ x T ( r ) H T H x ( r ) - ( γ - μ ) w T ( r ) w ( r ) - λ x T ( r ) P x ( r ) . 1 γ H T 0 H 0 < λ P 0 0 ( γ - μ ) I .
z T ( r ) z ( r ) = x T ( r ) H T H x ( r ) < γ 2 w T ( r ) w ( r ) . Taking the supremum over r ≥ 0 leads to (6). from (12). According to Theorem 3.1 of , (19) and (20) guarantee the exponential stability of the digital filter (1)-(3). This completes the proof. x ( r ) < μ χ λ min ( P ) λ , r ≥ 0 .
λ min ( P ) x ( r ) 2 ≤ x T ( r ) P x ( r ) = V ( x ( r ) ) < μ λ χ . Thus, we obtain the relation (21). This completes the proof. Remark 1. Recently, an H ∞ (or energy-to-energy) stability criterion for fixed-point state-space digital filters with saturation arithmetic and external interference was proposed in. In contrast to this study, the induced l∞stability criterion can handle the worst-case peak value of the state vector for all bounded peak values of the disturbance signals. Remark 2. For a fixed positive scalar λ, (7) and (8) are LMIs. We can apply various convex optimization algorithms to check whether these LMIs are feasible. In order to solve these LMIs, this article used MATLAB LMI Control Toolbox. the relation (6) can be represented by L(∞) < γ2. 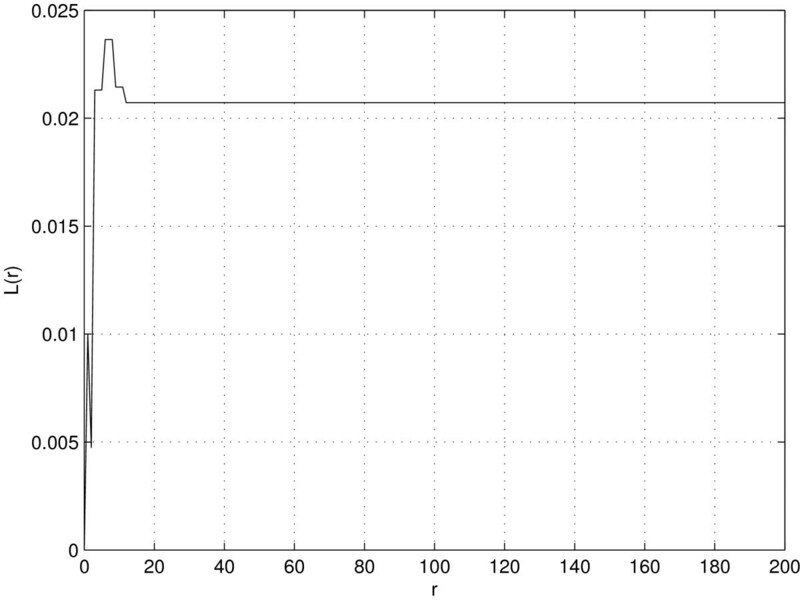 In the following section, through the plot of L(r), L(∞) < γ2is verified. A = 0 . 25 0 . 5 - 0 . 5 0 . 8 , H = 0 . 1 0 0 0 . 1 , w ( r ) = 0 . 5 cos ( 2 r ) 2 sin ( r ) . P = 0 . 1419 - 0 . 0014 - 0 . 0014 0 . 1507 , M = 0 . 1971 0 0 0 . 1684 , δ = 0 . 1623 , μ = 0 . 1500 . Figure 1 shows the plot of L(r), which is defined in (23). This figure verifies L(∞) < γ2 = 0.09, which means that the induced l∞ norm from w(r) to z(r) is reduced within the induced l∞ norm bound γ. Figure 2 represents the state trajectories of the digital filter (1)-(3) when (x1(0), x2(0)) = (20,-15.8). It is clear that stability criteria in existing studies [1–8] fail in the filter given by (1)-(3) with the parameters (24). On the other hand, the proposed criterion (7) and (8) verifies the exponential stability result with induced l ∞ performance in this example. The plot of L ( r ). This article studies a new criterion for the induced l∞ stability of fixed-point state-space digital filters with external interference and saturation overflow arithmetic. It is shown that the criterion can ensure to reduce the effect of the external interference to a prescribed attenuation level. Thus, it can overcome the disadvantages of existing stability criteria. For a fixed scalar variable, this criterion is represented in terms of LMIs and, hence, computationally tractable. Finally, a numerical example shows the usefulness of the proposed stability criterion. This research was supported by the MKE (The Ministry of Knowledge Economy), Korea, under the CITRC (Convergence Information Technology Research Center) support program (NIPA-2011-C6150-1102-0001) supervised by the NIPA (National IT Industry Promotion Agency). All authors contributed equally and significantly in writing this article. All authors read and approved the final manuscript.